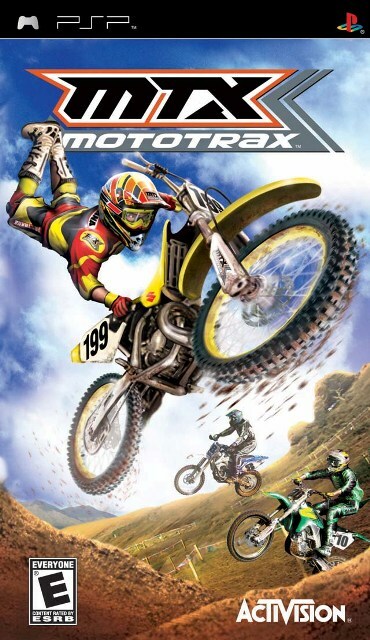 MTX: Mototrax is a Motocross based videogame that is made by Activision. Players have to use skills and tricks to progress through all the motocross disciplines – motocross, supercross and freestyle – to become the ultimate MX athlete. As you progress and earn cash, you can customize your rider’s attributes and purchase new equipment. Player can play alone in MTX: Mototrax or compete against seven other riders on more than 25 tracks, or hop online to challenge seven human riders at a time. The game features locations ranging from the Hawaiian Islands to the Australian Outback, authentic gear and bikes from Suzuki, Yamaha, and other manufacturers, as well as athlete Travis Pastrana and 12 other top pro riders. Game available for PS2, Xbox and PSP. IGN reviews MTX: Mototrax for PSP and concludes that decent overall rating of 7.2 out of 10 that MTX Mototrax offers a pretty decent ride through the world of dirt racing. It offers just about everything fans of the sport could want, including a good selection of tracks and a variety of game modes. It’s a little rough around the edges, both in the visuals and gameplay department, but these hiccups hardly get in the way of the game. Plus, the bundled track creator and multiplayer modes will keep the race going for a good while.